Because we must eat to live, it is important to recognize that nourishment is a basic way to be well and prevent disease. Tools exist to help shoppers choose healthy, affordable food. The Environmental Protection Agency has conducted extensive research proving that pesticides in our food and water have health and environmental risks. Consumption of certain pesticides is linked to cancer and neural toxicity. To read more, click here. In response to public concern, the Environmental Working Group started publishing a ‘Shopper’s Guide to Pesticides in Produce’ eight years ago. Researchers update the list annually, analyzing pesticide testing data from the Department of Agriculture and Food and Drug Administration to determine which foods retain detectable pesticides after being washed or peeled. The guide targets commercially grown food, separating it into two categories. It lists the ‘dirty dozen’: fruits and vegetables that transfer pesticide residues to the human body. It also itemizes the ‘clean fifteen’: produce that does not store pesticides and can be purchased conventionally. This resource strives to help shoppers consume as many fruits and vegetables as possible in an affordable way. For details, click this link. Buy these organically whenever possible. Kale, collard greens, and summer squash were added to the "avoid" list because they were contaminated with organophosphates, pesticides that pose a particularly high risk to the children's IQ and brain development even at low doses, and organochlorines, pesticides linked to stunted growth in kids. These are ok to buy conventionally. Pesticide residues aside, there are other reasons it's important to support organic 100 percent of the time, if you can, including protecting farm workers and local waterways from toxic pesticides that don't typically wind up in our food. Celebrate Workers and Local Food! Today, it's more important than ever to recognize the challenges facing farmers and workers across the food system. Farmers and farm workers, cooks, servers, cashiers, slaughterhouse workers, food factory workers, baristas, fast food employees, and many other groups are fighting for bettering working conditions, including fair wages and better prices for their crops, healthcare, gender equality, better safety conditions, and other basic human rights.Recognizing the challenges farmers and workers face--as well as the innovations they're developing--is critical for true food system sustainability. You can start by eating more local food and asking your local farms to support their workers with fair wages. Eating more local and seasonal foods can be easy, inexpensive and delicious! Here are 10 ways to eat more local food. Thanks to Food Tank for this information. Join a CSA (Community Supported Agriculture) program. CSA members pay for a weekly, bi-weekly, or monthly subscription, and get in return a box of vegetables and other locally-produced foods such as cheese, eggs, and breads or other food items. The CSA benefits farmers because they receive payment early in the season, and benefits consumers by giving them a box of fresh, local produce. You can search for local CSAs through Local Harvest’s website. Plant your own garden. It doesn’t get more local than your own back yard! Michele Owens’ book Grow the Good Life offers advice to beginner and experienced gardeners alike. Learn what is in season. Buying seasonal local produce ensures that you are supporting your area’s farmers, as well as providing your family with the freshest food possible. Organizations like Pennsylvania’s Buy Fresh Buy Local help consumers see what is seasonal in their state. Shop the local farmers markets. One of the oldest forms of direct marketing for famers, local farmers markets are gatherings where local growers can sell their fresh produce and value-added products. The U.S. Department of Agriculture (USDA) has set up a search engine for consumers to find information about their nearest markets. Visit "Pick-Your-Own" farms. Pick-Your-Own Farms are farms that allow customers to come in and pick their own produce, sometimes for a small fee. Similarly, gleaning programs have been established where consumers volunteer their services to pick produce that would have otherwise been wasted and donate it to local food banks for distribution. Research your restaurants. Farm-to-table cooking has become one of the hottest restaurant trends in recent years and, often, chefs will include the origin of their product on their menus. Organizations like Clean Plates have started compiling locavore restaurants into databases to make it easier and more enjoyable for consumers to eat healthily and sustainably in their local restaurants. Check your food labels of origin. Country of Origin Labeling Regulations require retailers to label the places of origin of their seafood, meats, produce, and nuts. Join a local food co-op. Food cooperatives are customer-and-worker-owned businesses where the customer pays a nominal annual fee and is, in turn, provided with high-quality, local food products. Freeze, can and preserve. During the bountiful summers, abundant fruits and vegetables can be frozen, canned and preserved for fresh, local produce later in the year. Buy Fair Trade. Search for Fair Trade certified products if local is not an option. 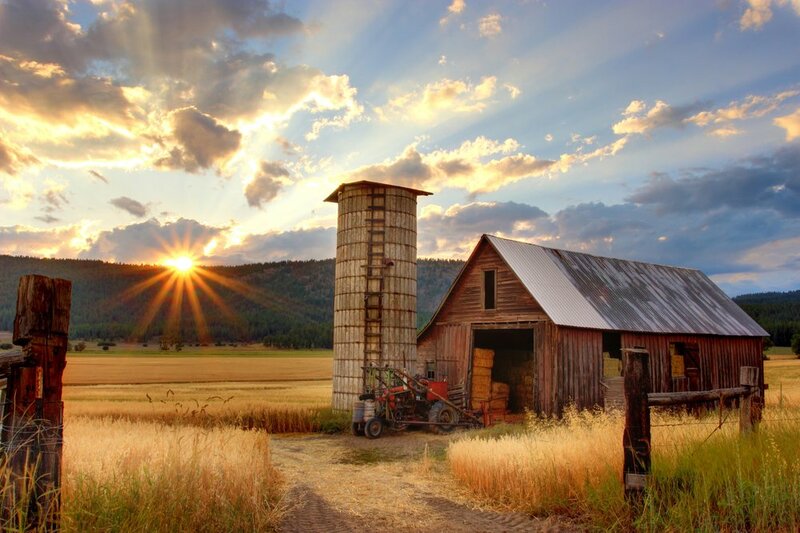 Fair Trade USA uses a market-based approach to empower farmers to get a fair price for their work and harvest and contribute to their local economies. "Cook", says Michael Pollan. It's the easiest way to tell Big Food you aren't interested in their junk. The amount of time we spend in our own kitchens has fallen by 40 percent since 1965, Pollan writes in his new book, Cooked: A Natural History of Transformation. Pollan examines how Americans spend time in front of TVs and computers, "outsourcing," as he puts it, the job of cooking to corporations and restaurants. The result? A serious obesity problem and an industrial agriculture system reliant upon unsustainable methods. What can we do to get healthy and take food back into our own hands? COOK! You can also speak out about food and health. 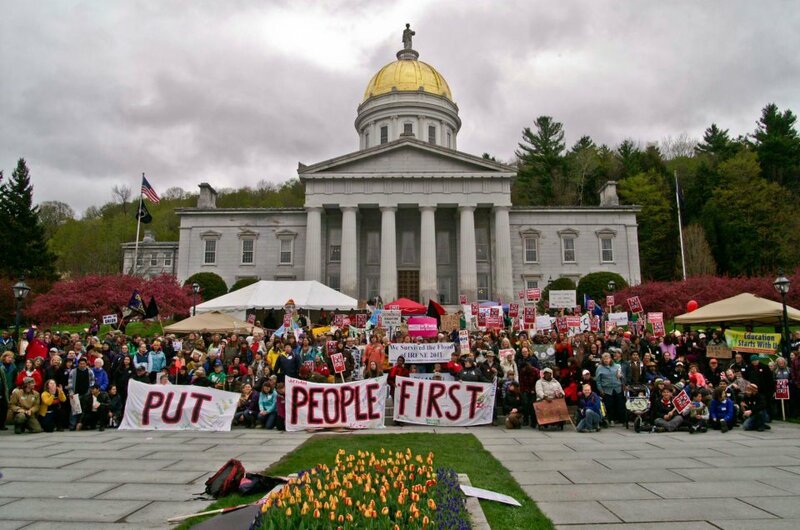 Come to Montpelier's Health Care Rally tomorrow, May 1st, on the Statehouse lawn from 11am to 4 pm. Health care is indeed a human right, and comes with healthy food. 11:30am - Arrival for Put People First March, Statehouse lawn. 12:45pm - Return to Statehouse. Group Photo. Put People First Framing. This project is a collaboration between the Healthcare is a Human Right Campaign, Vermont Federation of Nurses and Health Professionals and various independent health providers. Healthy Environment Livable Planet Space. This project is brought to you by the VWC, Rising Tide VT, and 350VT. Making sure that everyone in our community has access to healthy food, all thanks to donations and volunteer time. Youth for a better World. This space is a collaboration between the Vermont Early Educators United, Vermont Parents United and members of the Vermont NEA. Participatory Visual Art and Song Writing Projects.